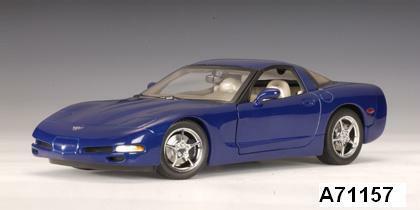 Chevrolet Corvette Coupe C5 Blue LeMans Commerative Edition 1/18 scale by AUTOart, $399.99 at Modena Motors Inc.
We specialize in hard-to-find and discontinued diecast cars, as well as new releases. We ship worldwide and are pleased to accept Visa, MasterCard, Amex, Discover, Union Pay, Interact, PayPal for payment. In-store purchases by appointment only, please. We would be happy to source any old items you may be searching for, through our worldwide network data base. Modena Motors is a top rated power seller on eBay International. Please click here to access our eBay store. I would like to know more about this product. C5 Corvette generation (2004) In LeMans Blue on Shale Interior. Finely detailed including chromed wheels, carpeting and gleaming paint. Stunning details AUTOart is famous for. In Stock. IN STOCK, BUT IN LIMITED QUANTITIES!! !